Welcome to the 2DaySigns.com web site. The following Terms of Service ("TOS") contain the terms that govern your use of the Web Site and 2DaySigns.com Service (as defined below). These TOS describe your rights and responsibilities and what you can expect from the 2DaySigns.com Service. Use of the 2DaySigns.com Web Site constitutes acceptance of these TOS. 2DaySigns.com is a Trademark of SS Graphics, Inc.
SS Graphics, Inc. reserves the right to add, delete and/or modify any of the terms contained in this TOS, at any time and in its sole discretion, by posting a new agreement on the 2DaySigns.com Web Site. If any modification is unacceptable to you, your only recourse is to not use the Web Site and the 2DaySigns.com Service. Your continued use of the 2DaySigns.com Web Site following posting of a new TOS on the 2DaySigns.com Web Site will constitute binding acceptance of the changes. 2DaySigns.com provides a number of Internet-based services through the Web Site (all such services, collectively, the "2DaySigns.com Service"). One such service enables users to create customized yard signs, signs, magnetic signs and merchandise, decals, stickers, and banners (collectively, "Products"). 2DaySigns.com users may create and purchase individual products for their own use. 2. Use of the Web Site and 2DaySigns.com Service. 2.1 Eligibility. SS Graphics, Inc. will only knowingly provide the 2DaySigns.com Service to parties that can lawfully enter into and form contracts under applicable law. If you are under the age of 18, but at least 13 years of age, you may use the 2DaySigns.com Service only under the supervision of a parent or legal guardian who agrees to be bound by these TOS. The 2DaySigns.com Service is not intended for children under the age of 13. 2.2 Compliance with TOS and Applicable Law. 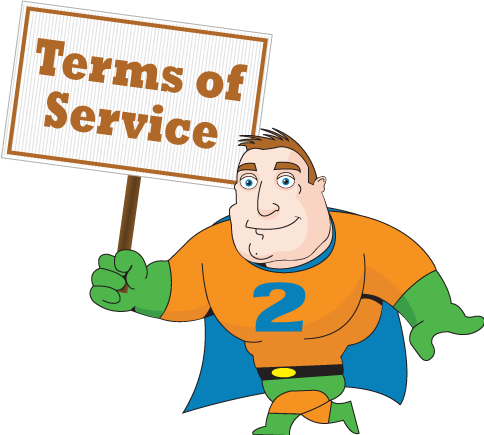 You must comply with all of the terms and conditions of these TOS, the applicable agreements and policies referred to below, and all applicable laws, regulations and rules when you use the 2DaySigns.com Service and the Web Site. 2.3 Your License to Use the Web Site and the 2DaySigns.com Service. (a) 2DaySigns.com solely and exclusively owns all intellectual property and other rights, title and interest in and to the 2DaySigns.com Service and Web Site, except as expressly provided for in these TOS. For example and without limitation, SS Graphics, Inc. owns the trademark 2DaySigns.com(TM), the copyrights in and to the Web Site. You will not acquire any right, title or interest therein under these TOS or otherwise. (b) 2DaySigns.com grants you a limited revocable license to access and use the Web Site and the 2DaySigns.com Service for its intended purposes, subject to your compliance with these TOS. This license does not include the right to collect or use information contained on the Web Site for purposes prohibited by 2DaySigns.com; to compete with 2DaySigns.com; create derivative works based on the content of the Web Site; or download or copy the Web Site (other than page caching). If you use the Web Site in a manner that exceeds the scope of this license or breach this TOS, 2DaySigns.com may revoke the license granted to you, and pursue any other legal course of action permitted under applicable state or federal law. 3.1 Prohibited Use. You may only use the 2DaySigns.com Service as expressly permitted by 2DaySigns.com. You may not cause harm to the Web Site or the 2DaySigns.com Service. Specifically, but not by way of limitation, you may not: (i) interfere with the 2DaySigns.com Service by using viruses or any other programs or technology designed to disrupt or damage any software or hardware; (ii) modify, create derivative works from, reverse engineer, decompile or disassemble any technology used to provide the 2DaySigns.com Service; (iii) use a robot, spider or other device or process to monitor the activity on or copy pages from the Web Site, except in the operation or use of an internet "search engine", hit counters or similar technology; (iv) collect electronic mail addresses or other information from third parties by using the 2DaySigns.com Service; (v) impersonate another person or entity; (vi) use any meta tags, search terms, key terms, or the like that contain the 2DaySigns.com name or trademarks; (vii) engage in any activity that interferes with another user's ability to use or enjoy the 2DaySigns.com Service; or (viii) assist or encourage any third party in engaging in any activity prohibited by these TOS. 3.2 Prohibited Use Promise. By using the 2DaySigns.com Web Site, you are promising that you are not using the 2DaySigns.com Service or the Web Site for any of the Prohibited Uses. You do not lose ownership of the Content that you design on, or upload to, the Web Site. By uploading Designs to the Web Site or creating Designs with 2DaySigns.com’s design tools, however, you grant the following licenses to 2DaySigns.com: the nonexclusive, worldwide, transferable, sub licensable right to copy, crop, reproduce, publicly display, sell, and distribute the Design in or on Products and in advertising, marketing, samples, and promotional materials for the purpose of promoting the Web Site and Products; and the right to make modifications to your Design as 2DaySigns.com, in its sole discretion, finds necessary to achieve the above listed purposes. You may remove the Content you designed at any time, and you retain any copyright and other intellectual property rights in that Content. If you choose to remove Content that you designed or uploaded and notify 2DaySigns.com of your intention to terminate the licenses described in the above paragraph, those licenses will terminate, except that 2DaySigns.com may fulfill all orders that are in any way derived from that Content placed prior to notice of termination and may continue to use said Content in marketing and promotional materials. 5.1 Monitoring. 2DaySigns.com reserves the right, but does not assume the obligation, to monitor transactions and communications that occur through the Web Site. If 2DaySigns.com determines, in its sole and absolute discretion, that you or another 2DaySigns.com user have breached or will breach a term of these TOS or that such transaction or communication is inappropriate, 2DaySigns.com may cancel such transaction or take any other action to restrict access to or the availability of any material that we may consider objectionable, without any liability to you or any third party. 5.2 Modification of the Service. 2DaySigns.com may modify the 2DaySigns.com Service at any time with or without notice to you, and will incur no liability for doing so. When you submit questions, comments, suggestions, ideas, message board postings, material submitted via web forms, contest entries, communications or any other information ("Submissions"), you grant 2DaySigns.com permission to use such Submissions for marketing and other promotional purposes, including the right to sublicense. You agree that 2DaySigns.com will have no obligation to keep any Submissions confidential. You will not bring a claim against 2DaySigns.com based on "moral rights" or the likes arising from 2DaySigns.com’s use of a Submission. This Section does not apply to your Content that will appear as part of your product that you use in connection with 2DaySigns.com Service. 7.1 Mutual Representations and Warranties. You represent and warrant to 2DaySigns.com and 2DaySigns.com represents and warrants to you: (i) that you or it has the full power and authority to enter into and perform under these TOS, (ii) the execution and performance of your or its obligations under these TOS do not constitute a breach of or conflict with any other agreement or arrangement by which you or it is bound, and (iii) these TOS are a legal, valid and binding obligation of the party entering into these TOS, enforceable in accordance with their terms and conditions. 7.2 By You. You represent and warrant to 2DaySigns.com that, your use of the 2DaySigns.com Service and any order that you place with 2DaySigns.com: (i) will not infringe the copyright, trademark, patent, trade secret, right of privacy, right of publicity or any other legal right of any third party and (ii) will comply with all applicable laws, rules, and regulations. You further represent and warrant to 2DaySigns.com that: (i) there are no claims, demands or any form of litigation pending, or to the best of your knowledge, threatened with respect to any of your Content; (ii) 2DaySigns.com will not be required to make any payments to any third party in connection with its use of your Content, except for the expenses that 2DaySigns.com incurs in providing the 2DaySigns.com; (iii) the use of any instructions, formulae, recommendations, or the like contained in your Content will not cause injury to any third party; and (iv) your Content does not contain viruses or any other programs or technology designed to disrupt or damage any software or hardware. 8.1 Disclaimer of Warranties. 2DaySigns.com provides the web site and 2DaySigns.com service on an "as is" and "as available" basis. 2DaySigns.com does not represent or warrant that the web site, 2DaySigns.com service or its use: (i) will be uninterrupted, (ii) will be free of inaccuracies or errors, (iii) will meet your requirements, or (iv) will operate in the configuration or with the hardware or software you use. 2DaySigns.com makes no warranties other than those made expressly in these TOS, and hereby disclaims any and all implied warranties, including without limitation, warranties of fitness for a particular purpose, merchantability and non-infringement. 8.2 Exclusion of Damages. 2DaySigns.com will not be liable to you or any third party for any consequential, incidental, indirect, punitive or special damages (including damages relating to lost profits, lost data or loss of goodwill) arising out of, relating to or connected with the use of the 2DaySigns.com service, based on any cause of action, even if advised of the possibility of such damages. Except for a breach of a party's representations and warranties under these TOS or in connection with your indemnity obligations under these TOS, in no event will of the liability 2DaySigns.com exceed the value of signs received or services rendered. The value of signs or services are limited to the stated value on the 2DaySigns.com web site or as quoted by an authorized 2DaySigns.com agent. You agree to indemnify and hold 2DaySigns.com and its employees, representatives, agents, affiliates, directors, officers, managers and shareholders (the "Parties") harmless from any damage, loss, or expense (including without limitation, attorneys' fees and costs) incurred in connection with any third-party claim, demand or action ("Claim") brought against any of the Parties alleging that you have breached any of these TOS through any act or omission, including but not limited to any claim that your content infringes or violates the legal rights of any other party. If you have to indemnify 2DaySigns.com under this Section, 2DaySigns.com will have the right to control the defense, settlement, and resolution of any Claim at your sole expense. 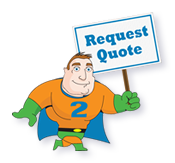 You may not settle or otherwise resolve any Claim without 2DaySigns.com ‘s express written permission. 11.1 Termination. 2DaySigns.com may suspend or terminate your use of the Web Site or 2DaySigns.com Service if it believes, in its sole and absolute discretion, that you have breached a term of these TOS. 11.2 Survival. Notwithstanding Section 10.1 above, these TOS will survive indefinitely unless and until 2DaySigns.com chooses to terminate them. 11.3 Effect of Termination. If you or 2DaySigns.com terminates your use of the Web Site or the 2DaySigns.com Service, 2DaySigns.com may delete any content or other materials relating to your use of the 2DaySigns.com Service on 2DaySigns.com’s servers or otherwise in its possession and 2DaySigns.com will have no liability to you or any third party for doing so. 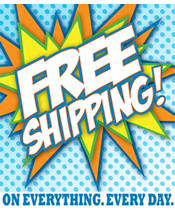 All notices required or permitted to be given under these TOS will be in writing and delivered to the other party by any of the following methods: (i) U.S. mail, (ii) overnight courier, or (iii) electronic mail. If you give notice to SS Graphics, Inc., you must use the following addresses: 2DaySigns.com, c/o SS Graphics, Inc., 4176 6th Street, Wyandotte, MI 48192.Sales@2DaySigns.com. If SS Graphics, Inc. provides notice to you, SS Graphics, Inc. will use the contact information provided by you to 2DaySigns.com. All notices will be deemed received as follows: (i) if by delivery by U.S. mail, seven (7) business days after dispatch, (ii) if by overnight courier, 48 hours after the date receipt is confirmed by such courier service, or (iii) if by electronic mail, 48 hours after the message was sent, if no "system error" or other notice of non-delivery is generated. If applicable law requires that a given communication be "in writing," you agree that email communication will satisfy this requirement. All disputes arising out of, relating to or connected with these TOS or your use of any part of the 2DaySigns.com Service will be exclusively resolved under confidential binding arbitration held in Wayne County, Michigan before and in accordance with the Rules of the American Arbitration Association, by a sole arbitrator applying Michigan law (without regard for conflicts of law principles). The arbitrator's award will be binding and may be entered as a judgment in any court of competent jurisdiction. To the fullest extent permitted by applicable law, no arbitration under these TOS will be joined to an arbitration involving any other party subject to these TOS, whether through class arbitration proceedings or otherwise. Any action to enforce an arbitrator's award will be brought exclusively in a federal or state court located in Wayne County, Michigan. Each party hereby irrevocably submits to the personal jurisdiction of the Federal and Michigan State Courts in Wayne County. By entering into these TOS, you hereby irrevocably waive any right you may have to join claims with those of others in the form of a class action or similar procedural device. Any claim arising out of, relating to or connected with these TOS or your use of any part of the 2DaySigns.com Service must be asserted individually. Notwithstanding anything to the contrary in this Section 13, either party may seek equitable relief, including, without limitation, injunctive relief and specific performance, without the requirement of posting a bond or other security or proving money damages are insufficient, from a court of competent jurisdiction. These TOS will be binding upon each party hereto and its successors and permitted assigns, and governed by and construed in accordance with the laws of the State of Michigan without reference to conflict of law principles. These TOS will not be assignable or transferable by you without the prior written consent of 2DaySigns.com. These TOS (including all of the policies and other Agreements described in this TOS, which are hereby incorporated herein by this reference) contain the entire understanding of the parties regarding its subject matter, and supersedes all prior and contemporaneous agreements and understandings between the parties regarding its subject matter. No failure or delay by a party in exercising any right, power or privilege under these TOS will operate as a waiver thereof, nor will any single or partial exercise of any right, power or privilege preclude any other or further exercise thereof or the exercise of any other such right, power, or privilege. You and 2DaySigns.com are independent contractors, and no agency, partnership, joint venture, or employee-employer relationship is intended or created by these TOS. The invalidity or unenforceability of any provision of these TOS will not affect the validity or enforceability of any other provision of these TOS, all of which will remain in full force and effect.